Find out just how easy and delicious going vegetarian (or vegan) can be, with the Oldways 4-week Vegetarian & Vegan Diet Menu Plan. We’ll help you create satisfying, balanced, budget-friendly meals for a healthy plant-based diet. 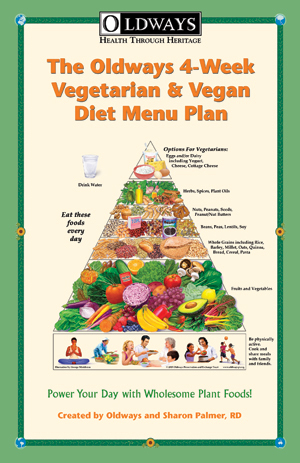 The traditional vegetarian diet, illustrated by the Vegetarian & Vegan Diet Pyramid, reﬂects the abundance of delicious, healthy foods such as vegetables, fruits, nuts, seeds, whole grains, legumes, herbs, and spices that ﬁt into a healthy eating pattern across many diﬀerent cultures. This book addresses the important nutrient-rich plant foods of the pyramid that can be eaten every day. It has been designed to serve as a guide for both health-care professionals and consumers who recognize the healthfulness of moving meat from the center of the plate and want to follow a well-balanced plant-based diet. This book is available as a soft cover book and as an e-book. To purchase the book, please visit our Oldways store using the Purchase in Store button below.